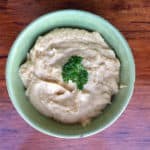 This Authentic Middle Eastern Hummus Recipe will spoil you forever. You will never buy hummus again. It’s SO good. 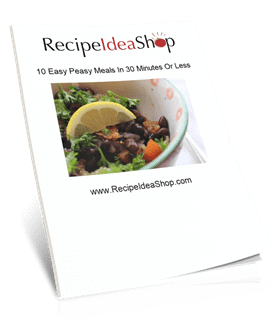 And it takes just 10 minutes and 4 simple ingredients. Authentic Middle Eastern Hummus is so good you will never buy hummus again. Super easy. Cuisinart Mini-Prep Food Processor. Buy one on Amazon today. Hi. It’s Lois, with an Authentic Middle Eastern Hummus recipe for you. When you make this recipe—trust me—you are never going to buy hummus again! It took me ten minutes, and it’s the best hummus I have ever eaten. 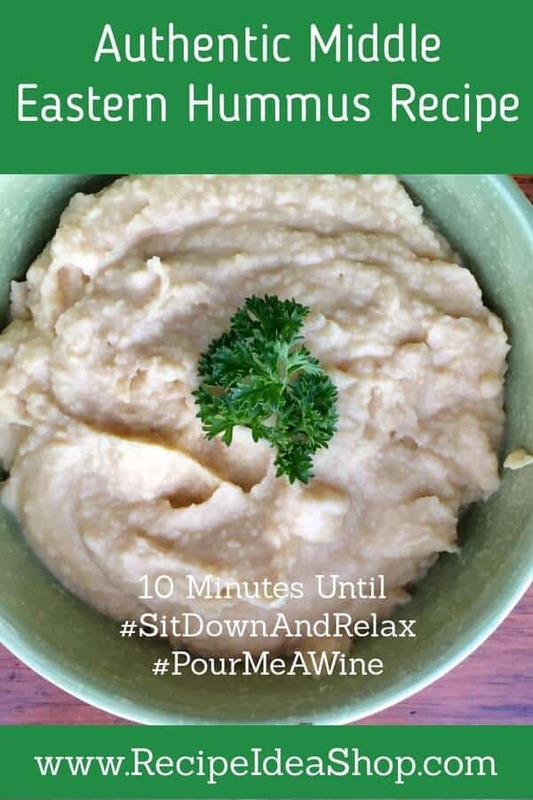 The cool thing is that this Authentic Middle Eastern Hummus recipe has only 4 ingredients! And they are all foods that I stock in my kitchen all the time: canned chickpeas (also known as garbanzo beans), fresh garlic, lemon juice (fresh or bottled), and salt. I was blown away at how good this hummus is. And, seriously, it took me 10 minutes. You do need to have a food processor or blender (like a Vitamix, which my daughter LOVES), though, so you can get the dip super creamy and blended. I have a mini food processor like this one that is just perfect for this Authentic Middle Eastern Hummus recipe. Unless you are making a huge amount of hummus, you should use the smaller food processor instead of a large one, but the full size food processor will do if you don’t have the smaller one. I have both and I use my smaller food processor all the time. I usually let people just dip their own veggies, but sometimes I fill celery sticks like Ants on a Log so people can just pick them up and eat them. My vegetarian grandson eats Authentic Middle Eastern Hummus as one of his regular meals. And really, this is the BEST Authenic Hummus ever! Be sure to comment when you try it. 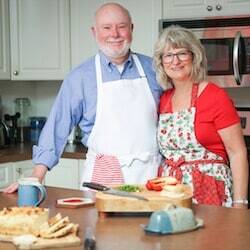 And share our recipes, will you? Trust me, you’re gonna wanna eat this. 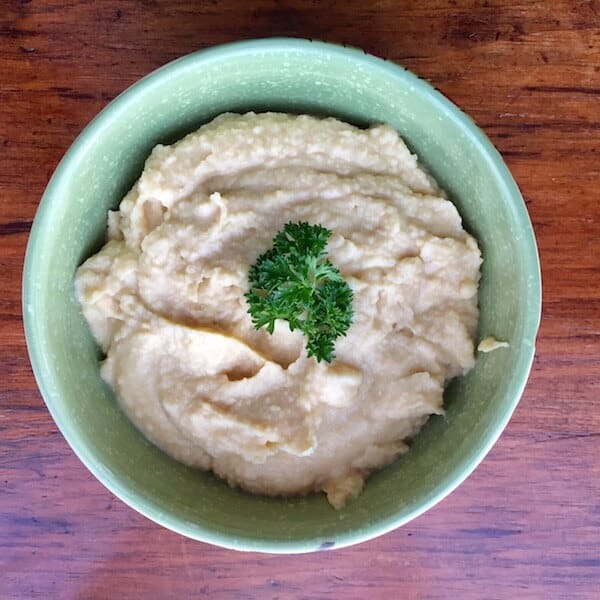 This is the best EVER Authentic Hummus recipe. And it only takes 10 minutes. You will never buy hummus again. Drain the liquid from the chickpeas. It's easiest to dump them into a sieve/strainer. Be sure to save the juice to use as egg white replacer! Place the drained chickpeas, peeled garlic cloves, lemon juice and salt in your mini food processor. Blend on high until smooth. Garnish with parsley, if desired. Authentic Middle Eastern Hummus Nutrition Label. Each serving is about 1/4 cup. Wondering what to eat with Hummus? It’s terrific as a dip or a spread. It’s vegan, gluten free, dairy free, nut free, and corn free, so just about anyone can eat it. No worries about allergies. I serve it with a variety of vegetables, such as carrots and celery sticks, broccoli, cauliflower, sliced red, green and yellow peppers, sliced cucumbers and cherry tomatoes. Or make some Chapati (similar to pita) and eat it with this delicious flatbread. I also eat it on Gluten Free White Bread (the best GF bread recipe ever!) as a sandwich. The hummus is low in fat, low in carbs, low in salt, and high in Vitamin B6 and Protein. Woot! Woot! I put tahini paste in mine. Yes, Eileen. Some recipes call for it, but it’s not something most people have on hand so I decided against it. I’m sure yours is excellent, too!